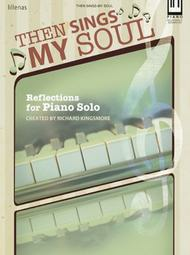 Then Sings My Soul (Reflections for Piano Solo). Composed by Richard Kingsmore. For piano. Sacred. Moderately advanced. Published by Lillenas Publishing Company (LO.9780834178724). 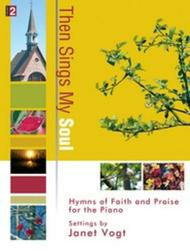 Then Sings My Soul (Hymns of Faith and Praise for the Piano). Composed by Janet Vogt. For piano. Sacred, Christian. Intermediate. Published by Lorenz Publishing Company (LO.70-1626L).The church pianist will enjoy allowing his or her musical soul to sing through the keyboard these familiar hymns depicting the Christian faith and offering praise to God. A relatively new name for the church musician, Janet Vogt is well known in the area of piano pedagogy and brings that valued knowledge and skill to these carefully crafted, accessible settings in her unique compositional voice. After adding this collection to your library, you will want to search for what she has already written and will look forward to future offerings from this talented composer.